The days of the nuclear family are sufficiently dead... No longer is the definition of an American family, mom, dad and 2.5 children. It literally can assume any number of combinations. 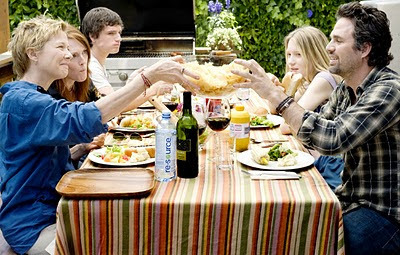 The Kids Are All Right examines the identity of the American family through the lens of the two biological children of a lesbian couple played by Annette Bening and Julianne Moore. Moreover, both children seek to better understand themselves by seeking out the person (Mark Ruffalo) who donated the sperm that allowed them to be. 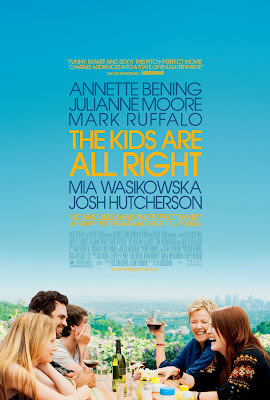 On the face of it, The Kids Are All Right is a pretty formulaic story. Kids want to know where they came from, locate father and find out he is a hipster. Best throw in promiscuity and add a pinch of marital strife for good measure. Also, who can forget extramarital affair between lesbian wife/ father and a bit of scorn. Sure, the plot is one one that has been seen before in variety of other films. In spite of this, The Kids Are All Right is a really good film and this in large credit is because of the cast. Everyone in this movie is wonderful and fit their roles or character types perfectly. The acting from Moore, Bening and Ruffalo was really top-notch and all seemed to be enjoying what they were doing. I really was impressed with Mia Wasikowska and Josh Hutcherson's performances, mostly because people playing teens tend to be hit or miss. All of them seemed natural and Ruffalo (as always) was spot on. After watching The Kids Are Alright, it was certainly deserving of it's four Academy Award nominations... The Best Picture one was a longshot (if there was a definition of the word) as was Ruffalo's but Bening would have deserved the award more than Portman and the screenplay was (subjectively speaking) as good as The King's Speech. Even with four losses, I think I would find a place for the film in my top ten or fifteen from last year... Then again, I think anyone to be hard pressed to find a film that captures the modern American family through realistic dialogue without sounding contrived or hokey.